It’s no secret around here that I’m a huge advocate for self-development. I love the idea of always trying to improve my life and work towards becoming the best version of me that I can possibly be. I’ve been a big fan of 30-Day challenges and the positive impact that they can make on your life. It’s said that 30 days is enough time to solidify a new habit that you want to incorporate into your daily routine, or even to subtract a habit that hasn’t been good for your health or well-being. Matt Cutts did a Ted Talk on this very subject that is totally worth the 3 minutes to watch and gain some inspiration from! The best part of 30-day challenges is that making small changes one at a time (aka focusing on only that one challenge over the course of 30 days), is much more sustainable over the long-term that trying to overhaul all of your habits and routines at once. In the spirit of wanting to provide a little inspiration to you to try a 30-day challenge of your own, I thought I would compile a list of 30-day challenge ideas that you might like to try for yourself. Now, the key is to remember that this list is just full of suggestions, so maybe you will choose one challenge to take on….or maybe you will feel so inspired that you’ll want to try twelve different challenges over the course of the next year. It’s totally up to you! The important thing is that you carve time out of your schedule every single day over the course of 30 days to devote to whatever challenge you choose. Maybe you bite your nails, smoke, or have a tendency to devour a pint of ice cream every night. If you have a daily habit that bothers you and is something you have wanted to stop doing for awhile now, this is your chance to make a change and phase this habit out of your life. You can quit anything for only 30 days! If you find yourself spending most of your days cooped up inside looking at a computer screen and want to experience more fresh air, then making a point to get outside every day might be a great challenge for you! Mornings can be rough. As a former night owl who took an awesome course (Makeover Your Mornings) that helped to turn me into a morning person, I can honestly say that life is a lot better when you start your day on the right note. In this post, I share various ways that you can make your mornings happier and I also include a free printable to walk you through my strategies. If you want to become a morning person too, be sure to check it out! Creating a side business of your own that you love and are passionate about can bring so much joy into your life! This blog is something I consider to be a side business, and it’s continued to amaze me that something I love doing so much can even help to pay my family’s bills! Talk about empowering. Maybe you’ve had dreams to sell your homemade crafts, run a freelance business, or even start a blog of your own. Take the next 30 days and spend an hour every day dedicated to getting your new side business up and running, and finally make your dream a reality! And if starting a blog is something you yearn to do too, be sure to check out my free tutorial where I walk you through all of the steps to do it! While it can be fun to indulge in TV or time spent on social media, it can also be easy to allow ourselves to become addicted to it. If you struggle with how much time you spend watching TV or engaging on social media and think it’s having a negative affect on your happiness, try going without it at all for 30 days and see if it makes a positive impact on your energy and overall state of mind! Life is never going to be perfect, so it can be easy to feel like a bad day means we have a bad life. I know I certainly am guilty of forgetting all of my blessings when things start to go a bit awry. Something that really helps to combat this is to keep a gratitude journal. Every night, challenge yourself to write down just three things you were grateful for that day or that put a smile on your face. At the end of your 30-day challenge, you’ll be left with a list of 90 things you were grateful for that month to look back on when life feels rough. What an amazing resource to have! Putting a smile on someone else’s face is always a guaranteed way to put a smile on your face too! Spend 30 days either completing one random act of kindness or giving a compliment to someone every single day and see if making others happy makes you happier too. Check out this post for more ideas on how to show gratitude for others to inspire you in this particular challenge. Too often we fail to make time for the things we most love to do. If you have a hobby that you tend to not always make the time for, try carving a few minutes out of your day for 30 days straight to spend on it. Spending time doing things we love and working on our passions is a surefire way to be happier and feel more fulfilled! Have you been trying to make exercise a regular habit for years now? Use this challenge as your muse to finally get on board with that habit! Try adding in just 30 minutes of exercise to your day. Even if it’s going for a walk or playing with your kids, just being active in any way is sure to give you more energy and make you feel better about yourself. When is the last time you read a book just for fun? Not because you had to, but just for the sake of enjoying a good book? It can be difficult to carve time out of your day to cozy up with a good book and let yourself get lost in it, but it always feels so amazing when you do! It’s good to let your mind wander and just enjoy a good story or even learn something new. Try reading one chapter of a book every night before bed for the next 30 days and see if it helps you feel more relaxed and maybe even inspires you! Negative thoughts happen to all of us. Sometimes when things are going wrong, it can be difficult to find even one good thing about the situation at hand. Challenge yourself for the next 30 days to see if you can try to find the positive in every single situation you encounter. When negative thoughts start to creep in, try to instead replace them with positive ones. You might be surprised at the end of your challenge to see that you’ve permanently changed your overall mindset and attitude! If you are a huge caffeine addict or dessert lover (I’m guilty! ), it might be interesting to challenge yourself and see if you can go an entire 30 days without consuming your favorite guilty pleasure. Perhaps at the end of 30 days you will still want to have your usual morning coffee or the occasional sweet treat, but maybe you will find yourself cutting back to an amount that you’re more comfortable with and can feel good about! If you tend to find yourself purchasing items you don’t actually need on a regular basis, try going for 30 days without purchasing anything new. Obviously you will still need to pay for groceries, gas, bills, etc., but try to go without purchasing things like clothing, gadgets, decor, and other “fun” items. See if taking on this challenge opens your eyes to your spending and consumption habits and if you find yourself enjoying new hobbies other than shopping! If you’ve been feeling overwhelmed by the amount of clutter and general stuff in your home lately, use this opportunity to ease into the process of decluttering and freeing up space. Try donating, tossing, or selling just one item a day for 30 days in a row. While this might not sound like it will make a huge impact to get rid of one thing at a time, just think about how at the end of the challenge, your home will be 30 items lighter than it was before you started. Small changes have the potential to make a big impact, especially when it comes to decluttering! With smart phones being so prevalent these days, it’s really easy to allow ourselves to get sucked into constantly texting, surfing the internet, and playing games on our phones. Spending more time looking at our phones to engage in these activities can cause us to lose sight of what’s actually happening around us in “real life”. Try spending a whole 30 days only using your phone for actual phone calls – no texting, no email, no internet, and no apps. See if making this change allows you to be more present and in the moment! 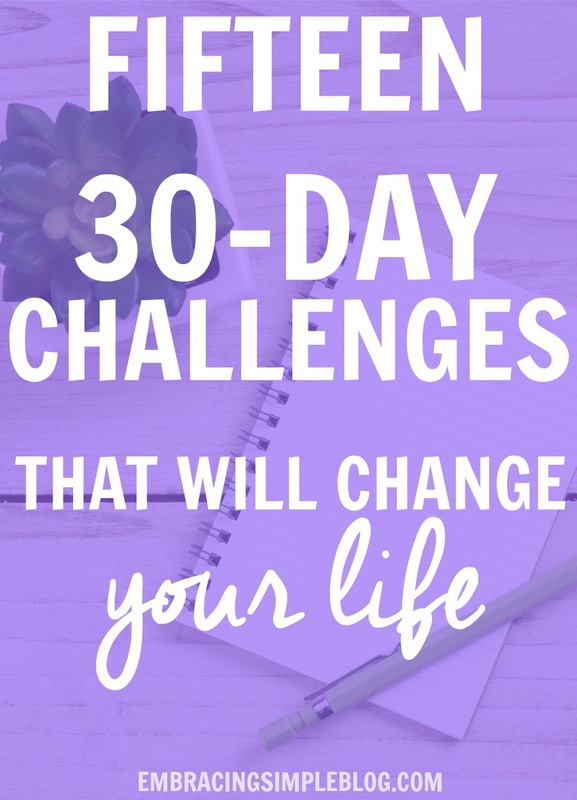 Are you ready to take on a 30-day challenge? Which challenge(s) appeals to you most, or do you have any other challenge ideas that you’d like to share with the rest of us? Leave a comment below! These are all great ideas. I stopped exercising for a while and am starting up again. I do a little in the morning before work and then some more exercises in my apartment after work. Then, on the weekends when I have more time, I hit the gym. That’s great Aliyyah! Even just a little bit each day makes such a difference, doesn’t it? exercise douse not work only 1 percent are able to stay thin you are wasting your life! What you mean is “exercise does not work for weight loss”. Which may be true, taking all factors into account. But a wise person once advised me “I can give you 100 reasons to exercise, but weight loss is not one of them”. Exercise for your mental health, for your physical fitness, for relaxation, to enjoy the outdoors, to feel strong, for your health, for your cardiovascular health… you get the picture. Wish I could print this out! I’m currently in the middle of numbers 2, 3, and 12! Thank you for the ideas and resources! Yay Audrey, that’s awesome! How did your 30-day challenges end up going? I’d love to know! All great positives for a better life! I have been clearing out the house in the pass several months and cannot believe how much stuff I actually have. I don’t need to shop and because of that I can read, walk, bike ride and just enjoy a simpler less stressful life. I love the idea of completing a 30 day challenge! Out of the ones you mention I like the get outside, keep a gratitude journal, or don’t watch TV ideas best. You bet Amanda! Thanks for the comment! I never thought of doing my own 30 day challenge, but that is a terrific idea! You can pick whatever it is you need to work on, and do it! I tried a 30 day “no spend” challenge and failed miserably, but I want to give it another go. I love TED talks! I would be most willing to challenge myself to get outside more, exercise, and/or give up a few sweets. I hate to say that health is the area of my life where I usually slack off and I want to change that. I do too Chonce, they are always so inspiring! And eating less sweets (even when I’m not pregnant, haha!) is definitely my guilty pleasure. I could improve in that area too!! I’m actually in the middle of a 30 day blog challenge right now and I’ve seen some improvement. It is amazing how much of a difference focusing on one thing for a specific amount of time can make! That’s awesome Emily! It really is amazing. I absolutely love the book reading challenge. Since the beginning of the year I promised myself that for 10 minutes each day I will read a book. It’s how I choose to start my day over, checking emails, visiting social media etc. , and it’s made a world of difference in my day. That’s a wonderful goal Terri! I would really like to start reading more myself, so I might have to try that too! Hi there! I love these ideas. I too am striving to live a more positive and productive life. I think 30 day challenges are fantastic, as just a simple task repeated daily can make such a difference. Thanks for sharing! Thank you for the sweet comment Abbi! I just found out about the Plastic Free July challenge and I’m going to give it a try. You have some great ideas too that I think would be easy to do along with it, like declutter and not buying anything new! Ooo I’ve never heard of that challenge before, that sounds like a great one though. Thanks for sharing Katherine! Once you stop watching television, it’s rather like not being around cigarette smoke any more. It never used to bother you but now you realize how offensive it is. I occasionally wander into the room where my husband watches only an hour or so a day and those usually Learning Channel shows or the like. Then I scoot right back out again. Those commercials …. yuck. Haha I love that analogy Mandy! So true! I love the concept of this 30 day challenge. I feel like if I try to do something or to stop doing something for 30 days it will inspire me to keep continuing on. Thanks for the amazing idea! Aw that’s awesome to hear, thanks so much Hanna. Best of luck with your challenge goals!! Christmas 2015, I decided that I would not eat out for the month of January. The first two weeks were difficult, but then it became normal for me to buy fresh food and actually cook in my kitchen. I saved money, and I lost extra pounds that I had been worried about. After my one-month committement, I kept it up through February. I didn’t eat out until spring break in March. My body and my wallet were much happier. That’s so fantastic Amy, way to commit to your goal and follow through with it 🙂 Thanks for sharing!! Great resources. Thanks for sharing! A few years ago, when seemingly surrounded by negativity and negative people, I decided to start saying hello and smiling at everyone I pass by. I also started complimenting strangers…on their hair, outfit, whatever. I was amazing to see the responses. In six or so years, I have never been responded to with negativity. People seem surprised when someone makes a tiny effort to smile or notice them. I have seen people who look angry, sad, overwhelmed, brighten with just a small compliment. you never know what struggles someone is facing, so be kind. Aw I love that Brenda, such a sweet testimony. Thank you for sharing and for inspiring me, I am going to start making more of an effort to do that as well. What a bright light you are! I have been putting off starting my own blog. Every time I get myself up to the point where I feel confident to begin,I tend to just talk myself out of it and put it off…again! So from today I’m taking up the 30 day challenge of creating my blog! Thanks so much Gaytri! That’s awesome, how is your 30 day blogging challenge going?! 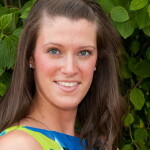 HI Christina, am putting together a package for my mindfulness tribe and found this post. Just wanted to send out a big thank you for giving me some clarity and getting my work off to a good start – these are great launch points – all of them. Very grateful to you indeed! In our home we have been trying to be more positive. We have seen a real difference in our lives because of it. Whenever a negative situation or thought comes around we counter it by saying or doing something positive. It absolutely works. I really like your list and I love challenges in general. I think the best way to start being productive and change yourself is becoming a morning person. It’s such a difference when you wake up early, it seems like a day is so much longer. I would love to try this, as I have been going through some changes and I need something to help me start. A very Big Thanks for you. Honestly this post inspires me alot. I recently got a fitness journal with a space for 30 day challenges. I kept drawing a blank on what challenges to write down. Do I only write down fitness challenges or something else? Then I found your list and I love it. I think I would like to add a challenge involving my kids. Perhaps getting them outside with me. Or getting them to school on time. I love all these ideas! I am in sixth grade and my core teacher is allowing us to do a 30 day challenge and keep an account of how it is going each day! At first I was sceptical as to what challenge I should do after hearing all of my classmates ideas and their own challenges. But thanks to your neat ideas I was quite inspired, in fact I am going to push myself even harder to pursue and follow up with my challenge. I actually saw the video of Matt Cutts on Ted talk as my teacher had shown the class. I can relate to all the commenters and how they are and were excited about their challenges after watching him speak. I thought it very clever of you to add that video there. I have decided to keep a gratitude journal for 30 days as my 30 day challenge. I hope this will improve my abilities to count my blessing each night with the knowledge that some people have no blessings to count. Thank you again, I will be sure to count you and your website as one of my blessings because I am sure that it will be a huge benefits towards my life. I love your blogs, they inspire me so much! I have decided to keep a gratitude journal as my 30 day challenge, because I have been putting off the idea of writing daily in my own blank notebook. I will be sure to include your blog as one of the things I’m grateful for. Thank you so much, and keep doing what you love. These are awesome challenges..its not really the challenge itself but the discipline which is really the challenge.. I’m going to tackle #6,#7, and #9 for starters..
Really liked what you said about building up the habit of discipline. I’m also planning to take on #7: acts of kindness this year!